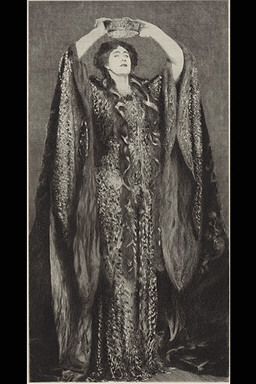 PORTRAIT OF ELLEN TERRY AS "LADY MACBETH"
"Of the nine important paintings by which Mr. Sargent is represented in the Exposition this is remarkable as being the only one in which he has given evidence of that curious and original imaginative power which he usually so carefully subordinates to the translating of the personalities of his sitters. In this striking canvas he had added to this intelligent translation, so vital a feature in all good portrait work, a dramatic and imaginative personification of the tragedy in the person of the actress; while basing his careful study of her individuality and her costume on the appearance on the stage he has lent to both a deeper and richer note of color and epitomized the whole in one fine characteristic attitude. In the long and tedious list of works in which art has perpetuated the personages of the drama it will be difficult to find one in which the inspiration of the artist has more admirably supplemented the great technical power of the painter working in rich and imposing tones of color."